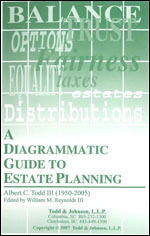 A conversational guide to estate planning. It is, in written form, the questions (with answers) that we frequently receive from clients in the office. 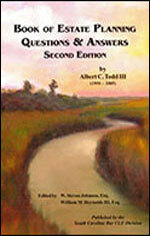 It provides an overview of complex questions. Do not use this book as a substitute for qualified legal advice. Use it to be better prepared when you seek help from a lawyer. The book is simply the answers to the questions that we find people are asking. They are written conversationally and simply. In fact, they are greatly oversimplified. We have tried not to use alot of legalese and we have included examples where they are helpful. We have even inserted a few diagrams because those are especially helpful in our practice. It is not written to be read like a novel or textbook. It is written with the premise that most people will look up specific topics or specific questions. Each chapter and often each question is intended to stand alone. For that reason, there is some overlap between chapters and sometimes between questions. 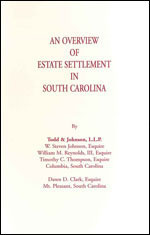 We have given the rights to this book to the South Carolina Bar Association and you can order one from them for $25 online. We do have a limited number of these books at our office for purchase. To obtain the full publication please contact us.